MP Patrick Mercer, counter-terrorism sub-committee chairman, said he was disappointed by the couple’s actions. He said: “Sir John and his family have been at the heart of the intelligence community for several decades now. And the Liberal Democrat Foreign Affairs spokesman, Edward Davey, tells the paper he wants Gordon Brown to launch an inquiry into whether the disclosures have compromised Sir John’s ability to take up his MI6 post. Sir John is currently the UK’s ambassador to the United Nations and will take up his new post in November. The Mail on Sunday says the information included the couple’s friendships with senior diplomats and well-known actors including Moir Leslie from BBC Radio 4’s The Archers. Lady Sawers revealed the location of the London flat used by the couple and the whereabouts of their three grown-up children and of Sir John’s parents, the paper added. Sir John is due to replace Sir John Scarlett as head of the overseas Secret Intelligence Service (MI6). 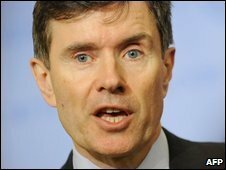 He has been the UK’s Permanent Representative to the UN since 2007. Before that he was political director at the Foreign Office, an envoy in Baghdad and a foreign affairs adviser to former prime minister Tony Blair. 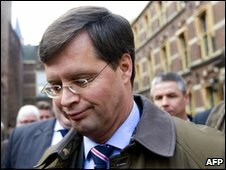 In that post from 1999 to 2001 he was involved in the Kosovo conflict and Northern Ireland peace process. Elsewhere overseas he worked in the British embassy in Washington, as an ambassador to Cairo and in South Africa from 1988 and 1991 when apartheid was ending. Iranian authorities have deployed thousands of security officers on the streets of Tehran, after a week of mass protests over a disputed election. Witnesses said there were no rallies in the capital on Sunday, a day after 10 people were reported killed in clashes between police and protesters. State media said 457 people had been detained over Saturday’s violence. The authorities have also continued a crackdown on foreign media – expelling the BBC’s Tehran correspondent. The corporation confirmed Jon Leyne had been asked to leave the country, but said the BBC office in Tehran would remain open. Campaign group Reporters Without Borders says 23 local journalists and bloggers have been arrested over the past week. The protests were sparked by the presidential election on 12 June, which officials said incumbent Mahmoud Ahmadinejad had won by a landslide. Supporters of his nearest rival, Mir Hossein Mousavi, believe the election was rigged and have demonstrated since the results were announced. But Supreme Leader Ayatollah Ali Khamenei has backed Mr Ahmadinejad and made it clear in a speech on Friday that no further protests would be tolerated. Some analysts interpreted the ayatollah’s speech as giving a green light for security forces to use live ammunition. 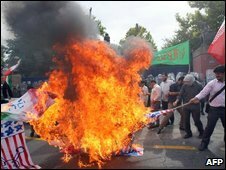 Iranian state TV reported that 10 people had died and 100 were injured when protesters and police clashed on Saturday. On Sunday, thousands of security officers were out on the streets but protesters stayed away. The BBC’s Jeremy Bowen, in Tehran, says many residents of northern Tehran could be heard shouting from the rooftops “death to the dictator” and “Allahu akbar” on Sunday evening. The chants have become a popular form of protest, and our correspondents says men, women and children joined in and Sunday’s chanting was much louder than on previous days. Security forces continued to round up protesters on Saturday – with state media saying 457 people had been arrested. Among the detained were several family members of Akbar Hashemi Rafsanjani – a powerful opponent of Mr Ahmadinejad. Analysts said the arrests came as a surprise because Mr Rafsanjani is head of the Assembly of Experts – a cleric run group which has the power to remove the supreme leader. All of Mr Rafsanjani’s relatives were reported to have been freed by Sunday evening. Meanwhile, Mr Mousavi, whose supporters make up most of the protesting crowds, urged them to continue their rallies. “Protesting against lies and fraud is your right. In your protests continue to show restraint,” a statement on his website said. Analysts say Mr Mousavi’s statements and the street protests his supporters have organised represent the biggest challenge to the state in the Islamic republic’s 30-year history. If you have any information you would like to share us! North Korea has stopped disabling the Yongbyon nuclear reactor and is making “thorough preparations” to restart it, a foreign ministry official has said. Hyun Hak-bong said that Pyongyang had suspended work to put the plant out of action because the US had not fulfilled its part of a disarmament-for-aid deal. Last month, North Korea said Washington had not removed it as promised from a list of state sponsors of terrorism. Pyongyang was expecting to be removed after finally submitting a long-delayed account of its nuclear facilities to the six-party talks in June, in accordance with the disarmament deal it signed in 2007. 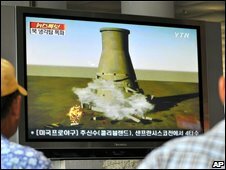 It also blew up the main cooling tower of the Yongbyon facility in a symbolic gesture of its commitment to the process. For its part, the US says it will refuse to remove North Korea from its list of state sponsors of terrorism until procedures by which the North’s disarmament will be verified are established. 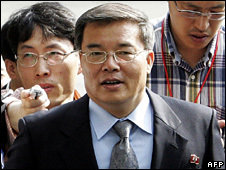 Mr Hyun claimed the process of decommissioning the plutonium-producing reactor at the Yongbyon plant was 90% complete. But he said Pyongyang would respond to the US by halting the process and “proceeding with works to restore [the reactor] to its original status”. “You may say we have already started work to restore them,” he told reporters in the border village of Panmunjom inside the Demilitarized Zone before sitting down for talks with South Korean officials on sending energy aid to the North. Mr Hyun also warned the US not to push for inspectors to verify the disarmament process work already undertaken, saying it was never part of the six-party deal. The diplomat said compelling Pyongyang to permit a “robber-like inspection method in the name of an international standard” would exacerbate tensions. Meanwhile, South Korea said it will fulfil the deal struck at six-party talks to supply the North with a million tons of heavy fuel oil or equivalent in exchange for nuclear disablement. 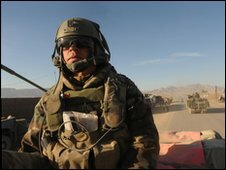 Nearly half has been delivered and AFP news agency quoted a South Korean negotiator, Hwang Joon-kook, as saying the rest would be sent. “We also want to make sure that the six-party process does not go backward,” Mr Hwang was quoted as saying. Some South Korean officials have expressed doubt over whether the North’s claims to be reconstructing Yongbyon are genuine or a ploy to exert pressure on Washington. In separate remarks by North Korea’s Mr Hyun, he reiterated North Korea’s rejection of reports that leader Kim Jong-il remains in ill health after suffering a stroke. He called the reports “sophism by evil people”. Earlier this month, reports in Japan, backed up by South Korea’s foreign ministry, claimed the North Koreans were actively reconstructing Yongbyon. The US later said plant workers appeared to be moving equipment out of storage, but that there was no effort to reconstruct it. Experts believe Yongbyon would take a year to restore, a view supported by a recent International Atomic Energy Agency report. The IAEA said the regime had already removed large quantities of essential nuclear materials from Yongbyon even before it agreed to dismantle the plant. China’s growing scandal involving milk powder suggests the country is still not able to protect its citizens from tainted food products. Despite many other recent cases involving sub-standard food, inspectors failed to prevent toxic milk powder being fed to children. Strict laws but poor enforcement appears to be part of the problem. China also seems to have a number of unscrupulous suppliers. Chinese consumers are only too aware of the problems, as they have shown by buying more trusted foreign brands of milk powder. At the center of this current scandal is the Sanlu Group, a company based in the city of Shijiazhuang in Hebei province. It has been selling milk powder tainted with the toxic chemical melamine, used in industry to make such things as plastics. This chemical makes the milk powder appear to contain more protein than is actually the case. So far, three children have died and more than 6,000 have been taken ill after drinking the powdered milk. Nearly 160 have experienced acute kidney failure. All the children who became seriously ill drank milk made with powder produced by Sanlu, according to Chinese health minister Chen Zhu. But the scandal is not limited to just one company. In a development that will surely worry the government, inspectors have found melamine in milk powder produced by 22 companies – one out of every five suppliers. China’s laws do not seem to be the main problem, according to a senior employee at a foreign firm that produces baby products in China. “There are laws and the laws are very strict. When we want to launch a product, there are so many things we have to do,” said the employee, who did not want to be identified. Chinese central government officials often complain that these good laws are not heeded, a claim backed up by the industry insider. 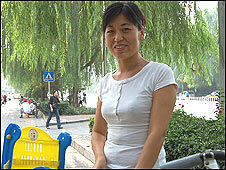 “There is a lot of corruption, and Chinese companies can often find ways to carry on producing,” she said. In order to avoid the problems now facing Sanlu, this foreign firm sends its own inspectors to check products bought from Chinese suppliers. As well as being prepared to bend the rules, some Chinese suppliers also seem willing to knowingly supply tainted food products. In this current case, melamine appears to have been added to fresh milk at milk collection stations, before being passed on to Sanlu. According to the state-run China Daily, one man arrested over the scandal confessed that he had added melamine to milk, despite knowing it was a health risk. He added that his family never drank the contaminated milk. As a senior official put it at a press conference on Wednesday, China does not test for melamine because it does not expect anyone to add it to milk powder. “There are no special requirements on the inspection of toxic chemicals… because these kinds of chemicals are not allowed to be added to food,” said Li Changjiang, head of the country’s quality watchdog. Perhaps the most damning indictment of the system comes from Chinese consumers, who have to eat and drink the products bought in markets, shops and supermarkets. 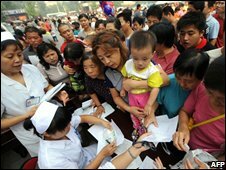 “It’s outrageous, nobody can eat anything any more,” said Tian Guangcai, who looks after his four-month-old grandchild. 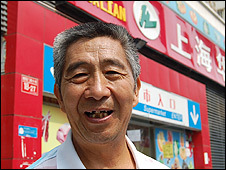 Mr Tian said the child – like many other Chinese children – only drinks milk powder made by foreign companies. Those foreign brands are now flying off the shelves. Wang Wenli, whose three-year-old son stopped drinking milk powder last year, is now even reluctant to let him drink fresh milk. “Think about it, if there’s a problem with the milk powder then there is likely to be a problem with fresh milk too,” she said. The government’s reaction to a baby milk scare in 2004 shows just how difficult it is for consumers to judge what is safe to consume. At that time, parents were told they should select one of 30 approved brands. This latest check has revealed that products from some of those approved firms contained melamine. Sri Lanka’s government has announced a ban on foreign aid workers and many of their local colleagues from working in Tamil-rebel held areas in the north. Defense Secretary Gotabhaya Rajapaksa said Colombo could no longer guarantee the safety of aid workers in the area. Colombo has intensified its war against the Tamil Tigers in a drive to crush their decades-old separatist struggle. Aid agencies have been helping some of an estimated 160,000 people displaced by the fighting in the north. They have in the past voiced concern for tens of thousands of people who have fled the frontline and sought refuge from the violence deep inside rebel-held territory. The agencies have yet to respond to the government’s announcement. An estimated 85,000 people have fled their homes in the area since June, according to the United Nations. The government said the ban would apply to all foreign aid workers in rebel-held territory and to their local colleagues who were not permanently resident in the area. Mr Rajapaksa said any people affected by the ban who were currently in the area should leave immediately. He said his government wished to avoid a repeat of the murder in 2006 of 17 local employees of French aid agency, Action Against Hunger. Sri Lanka’s government said Tamil rebels carried out the attack but international truce monitors said the killings were the work of the military. A United Nations official last year described Sri Lanka as one of the world’s most dangerous environments for humanitarian workers, prompting an angry rebuttal from the government. 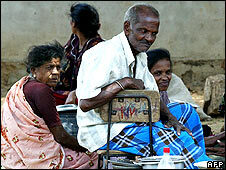 The Tamil Tigers have been fighting for a separate homeland in the north and east for 25 years. More than 70,000 people have died in the conflict. Do you work for an NGO in northern Sri Lanka? Are you affected by this announcement? Send us your experiences.